While there is so much more than just ‘speed’ that you need to think about when it comes to looking for an electric scooter, I do understand if speed is at the forefront of your mind. 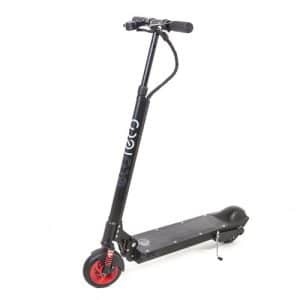 After all, if you are picking up an electric scooter, it should get you from point A to point B faster than walking or light jogging. Here is my list of seven fastest electric scooters on the market. There may be other fast or even faster scooters out there, but I have excluded them from the list because all they really have going for them is speed. They just do not function well in any other aspect and I doubt that you would want to be riding them. This Taiwanese-built electric scooter is probably the fastest on the market. It is able to achieve a whopping speed of 35 mph. Despite the high speed, the company has not really sacrificed any of the other features that you find on the scooter. For instance, let’s take the range of the Qiewa Q1. It is able to travel a tremendous 60 miles in good conditions. However, it is unlikely that you will get close to that, mostly because the Qiewa has been built to be more of an off-road scooter. But it is nice to have a range like that nonetheless! Honestly, Qiewa Q1 is not the most portable electric scooter in the world. It weighs in at a hefty 60lbs, so you will not to be carrying this around. However, you get a lot for your money. That includes front and rear suspension as well as front and rear disc brakes, LED headlights and taillights. In fact, it has lights everywhere you can imagine. This is a scooter you can also lock up without issues. It has an alarm and a keyless remote. Qiewa Q1 is an electric scooter for a very specific purpose (i.e. having fun off the road), however, it is also the fastest one on the market without a doubt. This scooter clocks in at 30 mph. However, it has a bit of smaller range than some of the other scooters on this list. You will be able to get about 12 miles out of it before it needs to be charged, if you are travelling at full speed. Nevertheless, the UberScoot has one handy built-in feature. On the ‘control panel’, you will find a button which allows you to switch on economy mode. If you hit this, then the maximum speed of the electric scooter will be capped out. Acceleration will be severely limited too. This means that you will be able to squeeze a few extra miles out of the UberScoot, which is ideal when you are going to travel for commuting. After all, you will most probably not need to travel at 30 mph while commuting anyway. There are other features on this scooter too. 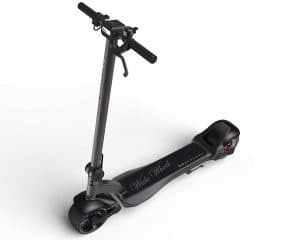 There is an in-built seat (which you can remove if you wish), which means that you can use the UberScoot for riding in either a seated or a standing position. I can’t imagine that many people will be riding the scooter in a seated position though, because the seat is quite small. However, it is always nice to have the feature in case you may need it. The scooter is the heaviest that you will find on this list. It weighs in at 117lbs. This means that you won’t be carrying this baby around while in a hurry. This is actually a little bit odd, because it is a folding scooter. However, I guess it is really meant for folding while in storage, not for carrying around for long periods of time. Next up on my list is the Speedway IV. A seriously good-looking scooter which is able to travel at 28 mph. The range of this scooter is a whopping 20 miles. It may not seem like a lot, but I would be seriously surprised if you are travelling anywhere close to that each day. You will probably be doing a fraction of that. The scooter has a huge 600 watt motor. This means that you should be able to tackle large hills with ease. It comes with 10” tires and both front and rear suspension. This means that you will even be able to move up and down on bumpier roads. It’s not a scooter that has been built solely for the flats. Speedway IV is going to be a slightly costlier electric scooter than some of the others on the market, but there is a good reason for it. You can control it really well! The LCD screen will allow you to switch between ride modes, and you can even switch on cruise control, which means that you can maintain the speed on more stable roads if you wish. Unlike some of the other scooters I have spoken about on this post, this electric scooter is built for portability. You can fold it down and pull it around like a suitcase. It is not especially bulky either, so I can’t imagine that you would be getting in people’s way when you do this. 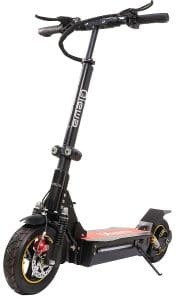 It is a well-constructed electric scooter, which means that if you buy it, no matter how high the price tag on it is, it will last you a while. The MotoTec Mad clocks in at 28mph. I don’t think the look of this scooter is going to make it ideal for those who are travelling around and commuting to and from work. This is very much a scooter which is built for off-road riding, although I am sure that this is something that you picked up from its name. The max range on this scooter is 35 miles, and you have a 1600 watt motor built into it. 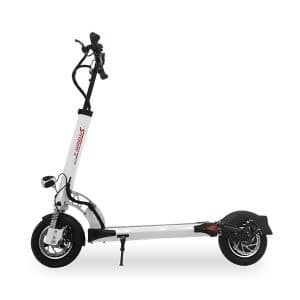 However, you will only be able to get that huge range if you opt for the lithium ion version of the scooter, which is going to set you back a small amount of extra cash. The tires on this scooter are huge, and they have been built for one purpose. That is for going off-road. However, it makes a surprisingly good touring scooter. This is because you have different parts of the scooter where you can easily hang some bags. In fact, I know several people who have used this scooter for day trips. You are probably not going to want to be commuting about with it as it can be a little bit on the bulky side. It also does not fold down that flat. Sure, you can fold down the handlebars, but it is not that good for long distance transport. You also can’t use this scooter in standing mode. The seat on the scooter takes up a decent amount of space and it can’t be removed. That being said, the low handlebars mean that this scooter was probably never designed for people to stand up on in the first place. This is a scooter with the max speed of 27 mph. It weighs 75lbs and has a max range of 20 miles. 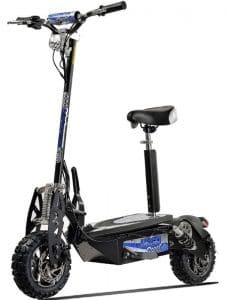 While the power of this scooter means that you can travel off-road with it, it is more likely that people are going to be using this on their daily commute. You will be able to enjoy an incredibly smooth ride if that is what you end up using it for too. The Super Turbo 1000 Elite has 10.5” tires on it, shock absorbers at the rear and the front of the vehicle and a heavy duty chain. This means that no matter how rough the terrain you are travelling on is, you are going to be able to enjoy an incredibly smooth riding experience. You are able to choose between drive modes on this scooter, although it is not really going to change the range for you. You can either opt for eco or turbo mode. Only opt for turbo mode if you are going to be travelling off road or something like that. This is because the turbo mode does not have speed limitation in place, which means that if you are travelling in packed areas, you are going to be braking almost constantly which can severely lower the range that you get out of your scooter. It is more for those times when you really want to go ‘all in’. 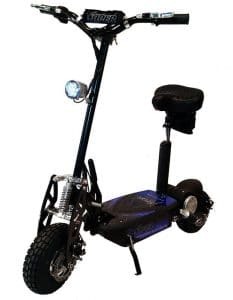 This is a well-built scooter and it is easily going to provide you with years and years of happy use. However, one thing that I especially loved about this scooter is the fact that just about every single part on it is replaceable. It does not take long to get hold of the replacements either. Any shop worth their salt will keep them in stock, but if you have trouble sourcing parts in your local area, then you can give the company a call and they will be more than happy to sell you any part you need. The parts are affordable as well. This is the first scooter on this list which actually looks like your traditional micro scooter. 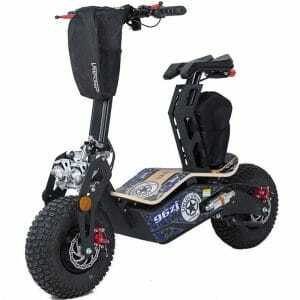 It has a 500 watt motor which is able to offer 25 mph max speed over a range of 15 miles. The WideWheel is called so due to the size of its wheels (which was likely obvious). It is the size of these wheels which actually help you to get the most out of this scooter. Apparently, the wheels aid with the speed. However, they also provide you with another huge benefit. If you are travelling at a fast speed, you need to make sure that the scooter is not rocking all over the place otherwise it will cause issues. The wide tires help to provide a decent amount of grip. They also help to ensure that the suspension works properly so that you have an incredibly smooth ride. Despite the wealth of features that can be found in the WideWheel, it is a surprisingly light scooter. It comes in at just 37.9lbs, which means that most people shouldn’t have any real issues in folding it up and carrying it around. This means that this is the type of scooter which is going to be perfect for your daily commute to and from work. The final scooter on my list is EcoReco M5. It comes in at a maximum speed of 22mph and with a range of 20 miles. The weight is 36 pounds, which means it should not be that difficult to carry around. There are actually several features on the EcoReco M5 which are not included on the other scooters mentioned, but you wouldn’t realize they would be handy to have until you have experienced the feature yourself. For example, this scooter contains a tripod mount which will allow you to have your phone in place. This means that you can have a GPS on your scooter, which is great for travelling around in not so familiar places. It doesn’t take too long to charge up this scooter either. You should be able to get it almost charged (around 80% full) in a shade under 3 hours. Most other scooters on this list are barely going to achieve that within 7 hours. This is very much a scooter which has been built for portability too. It literally takes seconds to fold it up, and it is so small that you can hold it in front of you while you are travelling on public transport. This scooter is a little bit on the expensive side in comparison to other scooters on this list, but the price is hardly going to break the bank. Plus, the price is fair enough for something of high quality. None of the parts on this will need to be replaced for years.